When it comes to cannabis, do you prefer quantity or quality? If you’re one to read online product reviews like this, you’d probably want the latter, and Pure Cure cartridges are known to be quality. This might sounds like empty braggadocio in an industry where similar declarations are commonplace. In certain regards, these claims are gratuitous; Pure Cure doesn’t expect their products to make you become one with the planet, but they do deliver in one very significant way. So what does that mean for you, the refined connoisseur, whose existence is a quest of Tolkienian proportions to find the one true ring of weed? Too far? Here’s a rundown of Pure Cure Cartridges. Where Can You Buy Pure Cure? Based in Oakland, Pure Cure is a relatively small non-profit committed to keeping its products safe and organic. As the wording of their mission statement suggests, the company’s rooted in liberal methodologies. Their cannabis is grown outdoors and their concentrates are extracted with ethanol to ensure a pure and healthy product. But alcohol based extraction is no supercritical CO2 extraction, which produces an even more refined final product. Alongside their vape cartridges, the company offers 500mg syringes of concentrated oil used for refilling empty cartridges, dabbing, or orally ingesting via foods and by itself; as well as medicated mouth strips in indica and sativa varieties that work like dissolvable Listerine strips. The Pure Cure line is limited, but each product serves a unique purpose. They don’t list exactly where their products can be found, and even a Google search comes up almost empty, so finding them in your local Southern California dispensary might be tough, which is why we recommend using Nugg to find which delivery services in your area carry the product. 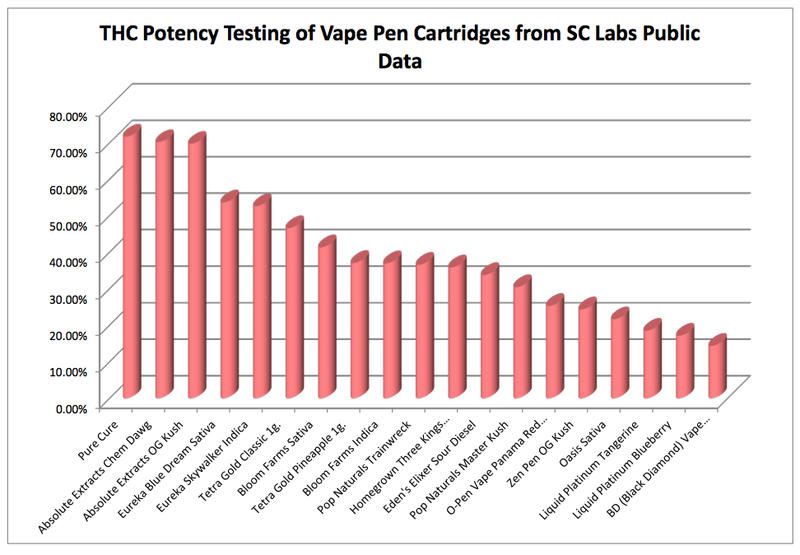 For a large number of prospective buyers, the amount of THC contained in one cartridge is a valid selling point (if not THE selling point), and you can’t argue with the numbers. In an independent lab test conducted by SCLabs in Santa Cruz, Pure Cure cartridges’ THC content was found to boast 70% THC content, higher than nearly any competitor. If getting as much THC as possible is your personal mark of quality, these cartridges are a no-brainer. Regardless, if the results are real, this amazing product potency is possible thanks to a proprietary process that utilizes the whole organic plant and contains no added glycerin or glycol, while a dewaxing step gives the extract a strong and viscous consistency, making the vapor smooth and easy to inhale. Odor and taste are essentially non-existent compared to other, similar products, so getting a huge dose of THC is not only possible with Pure Cure cartridges, but discreet and easy on the senses. Pure Cure cartridges are compatible with any universal 510 threading vape pens. Due to the liquid’s high viscosity, these cartridges may take longer to heat than most, so if this becomes troublesome or just annoying try pre-heating them in warm to hot water before use. As far as value goes, Pure Cure cartridges are a solid investment; but if your wallet’s tight $45-$50 a 500mg (.5g) cart might seem bit pricey. Unlike most cartridge companies, Pure Cure products are only available from a handful of dispensaries across California, mostly in NorCal, that you can find on their dispensary map. If a location is close enough to you, call to be sure they’re in stock, then head over or wait for delivery. Or you could simplify everything by using California’s premiere MMJ marketplace, Nugg, to be sure you’ve found the lowest possible price and have the cartridge(s) brought to you. The whole process is as easy as ordering pizza! Don’t forget that if you got your rec or renewal from NuggMD, you’ll receive $20 credit! Very few complaints here. 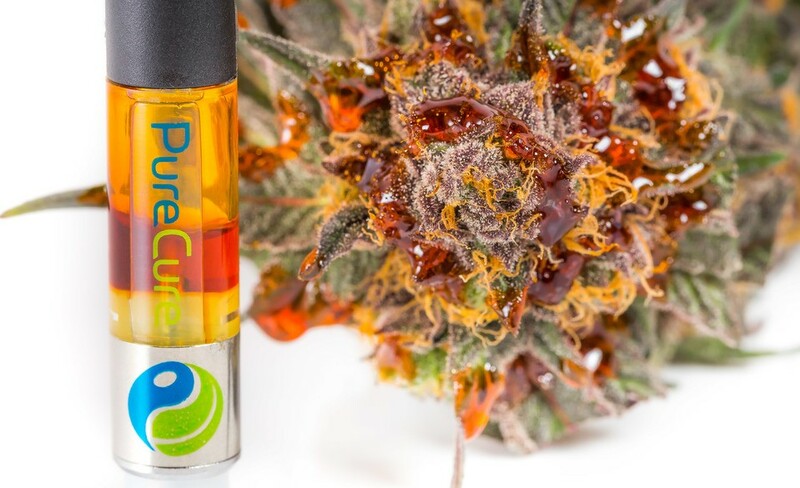 Pure Cure cartridges get the job they claim to do done with no hassles or significant hiccups, minus the slightly thicker viscosity. Clocking in at 70% THC, this is, of course, where Pure Cure has the edge on virtually every other competing vape cartridge brand. They’re one of the industry leaders in THC potency. These will go unnoticed by most users. Aroma and taste are hardly noticeable, and will make discreet vaping easy. The average price point is justified by its unmatched THC content, some value is lost in the process. When considering buying Pure Cure cartridges, it’s essential to ask yourself how much you’re willing to pay for quality. Buyers who put quality above all else (and maybe Lord of the Rings fans too) will more likely be willing to pay a little extra for the variety of cartridges. For others, this may be more of a novelty as a lower price for a lower THC content could seem like the better purchase. But for most patients looking for a large, powerful cartridges in different strains, these are widely available and highly effective. Pure Cure cartridges are the best ever! I use to have on an old cartridge and replaced it with Pure Cure. Believe me!